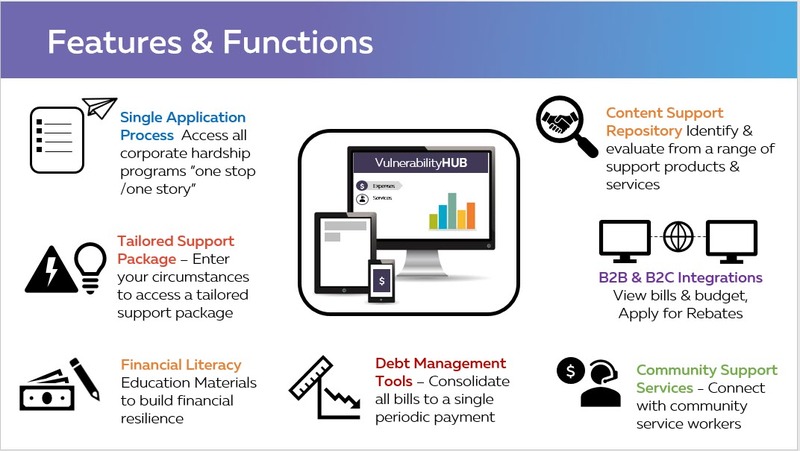 The One Stop One Story Hub resides at the heart of our vision; a one-stop/one-story solution providing a single-entry point to access all vulnerability support services across private, public and community based organisations. The solution offers consumers and community organisations the opportunity to identify and access tailored support in holistic, simplified and dignified way. Ultimately, the One Stop One Story Hub is a system solution to building community resilience. TCP from YVW on Vimeo. TCP is partner led and began from a need within business to work together to solve business challenges. It is our chance, as Corporations, Governments and Community Groups to come together and bring systemic change. Standing together to implement policies, practices and initiatives that result in tangible change for people experiencing vulnerability and hardship. Vulnerability is a fact of life for millions of Australians. Nearly 3 million live below the poverty line , including almost 750,000 children. to reducing. More than half of all Australians are in situations of financial vulnerability and we know are not accessing support services. Almost half have struggled to pay a utility bill in the last 12 months.They are struggling with the increased cost of living, just getting by or perhaps struggling with a personal situation that is beginning to impact their financial wellbeing. When we park our competition at the door, and work together we can bring about significant change in the lives of many Australians living on the brink of poverty. Right now, millions of Australians are only a lost job, a relationship breakdown or a medical emergency away from falling into serious financial distress. And 1 in 10 Australians are already there. For too long, our sectors have not worked well together - trying to fix issues on our own. We’ve created siloed solutions that are genuinely trying to tackle this issue but not having significant impact. But, when we park our competition at the door, and work together we can bring about significant change in the lives of many Australians living on the brink of poverty.When we aren’t working together, we can’t support vulnerable Australians and our whole community suffers. And, if we truly commit ourselves to being in and of our communities, we will see the benefits as well. We know that customers are not accessing already available help because of lack of trust. We all struggle with declining organisational trust. We’ve made no headway in rebuilding trust - with Governments, businesses and even NGOs sitting stagnant in the 2018 Edleman trust barometer. We know that customers are not accessing already available help because of lack of trust. And, we all know that businesses need to work at rebuilding the trust to be able to reverse the current trends. And our communities will only thrive if the institutions that underpin them are at the same time trusted, and authentically working to earn that trust.That’s why I’m so passionate about what’s next for TCP. The One Stop, One Story Hub is an innovative technology solution which aims to reverse the growing number of financially vulnerable people in Australia. The One Stop, One Story Hub is an innovative technology solution which aims to reverse the growing number of financially vulnerable people in Australia. It will provide consumers an essential service and single point of entry where they can gain access to financial hardship assistance across all essential services at the one time, in a dignified way. This initiative hits the sweet spot. It’s a simple, innovative use of technology. It works for vulnerable people first and foremost. It requires all of us to come together to make true change can happen and catch people early so they don’t slide into severe financial crisis. 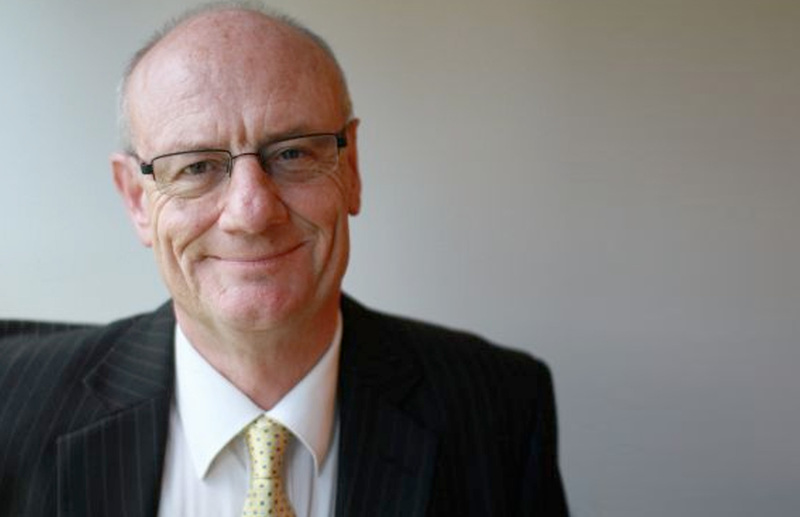 So, as we think about how we might support Thriving Community Partnerships, and as we hear a little more about the One Stop, One Story Hub, consider how you, and how the organisation you represent is building the foundations for every Australian to have a full life, and for communities to thrive. Why do we need The One Stop One Story Hub? Customers presenting in vulnerability or hardship experience distress as they are required to continuously repeat their story to each organisation. This emotional burden creates an additional barrier to access as it discourages people from seeking help. Vulnerability and hardship is complex and often deals with customers who have multiple issues that require a range of services. 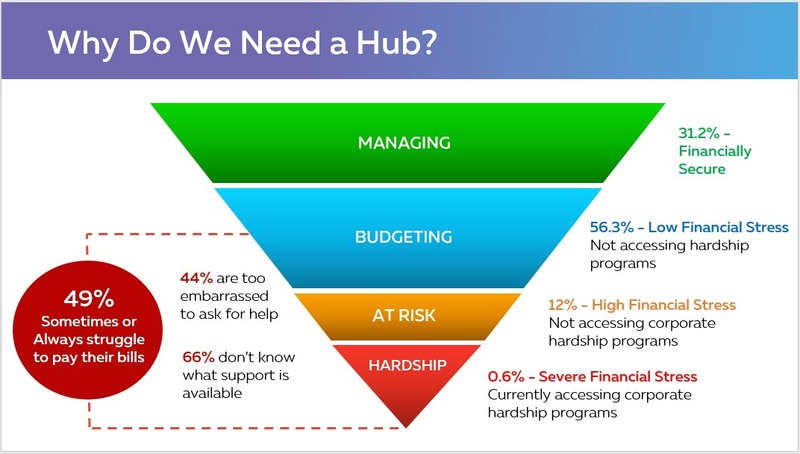 Currently 49% of Australians sometimes or always struggle to pay their bills, and within this group 44% are too embarrassed to ask for help and 66% don't know what support is available. A website that provides a single point of entry for all vulnerability support services, allowing organisations to use technology and shared data to support vulnerable people more effectively. We’re thrilled to announce that both AGL Energy and EY have committed both financial and business capability to commence this Australian first partner led co-created project. 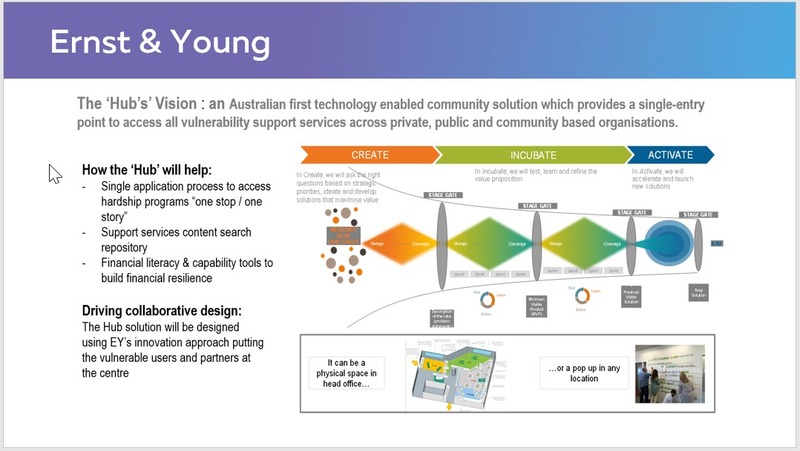 EY will be leading the approach to develop this Australian first technology enabled community solution which provides a single-entry point to access all vulnerability support services across private, public and community based organisations.